One of the most important elements needing to be addressed during the construction of a pipeline is ensuring that appropriate water control measures are in place. Prior to back-filling the trench, PolyLevel® trench breakers, or water stops, should be installed to control excessive amounts of water from flowing through the porous soil material and compromising the stability of the pipeline. These breakers also prevent erosion and wash-out of the soils within the trench, which is valuable when protecting native soils and sediment that would otherwise be washed out by the trench. 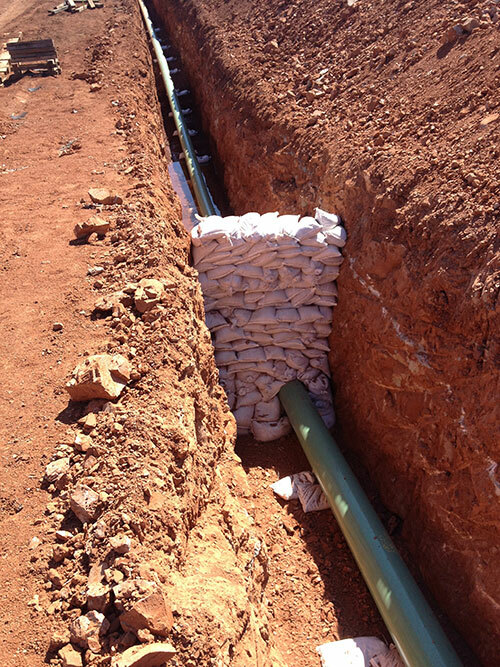 Safety – PolyLevel® foam can be installed from grade level, thus eliminating the need to work within the trench. 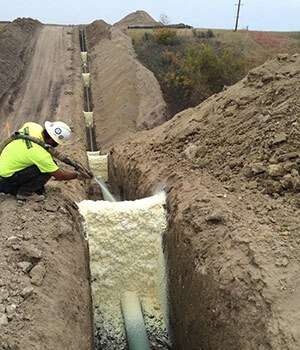 Efficiency – Several trench breaks can be installed utilizing PolyLevel® foam in the time it takes to install one trench break utilizing other methods. 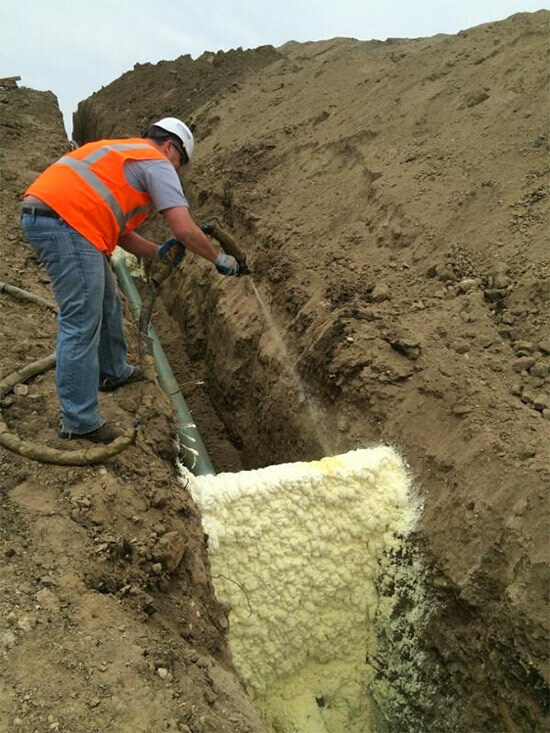 Performance – Superior adhesion of the PolyLevel® foam contours to the shape of the trench and pipeline, creating a completely water-tight seal to eliminate erosion of the soils. Cost Effective – With the speed of installation allowing the trench to be backfilled within 15 minutes after application, superior long-term performance, and less labor needed for installation, PolyLevel® trench breakers can offer significant cost savings over alternative options. 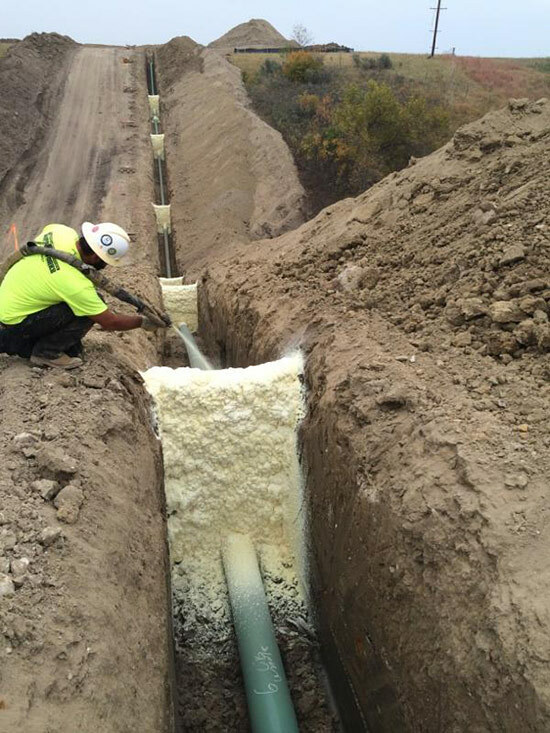 Durability – PolyLevel® foam is specifically engineered with an extremely low exothermic reaction, allowing it to be installed quickly in deep trenches without breaking down. 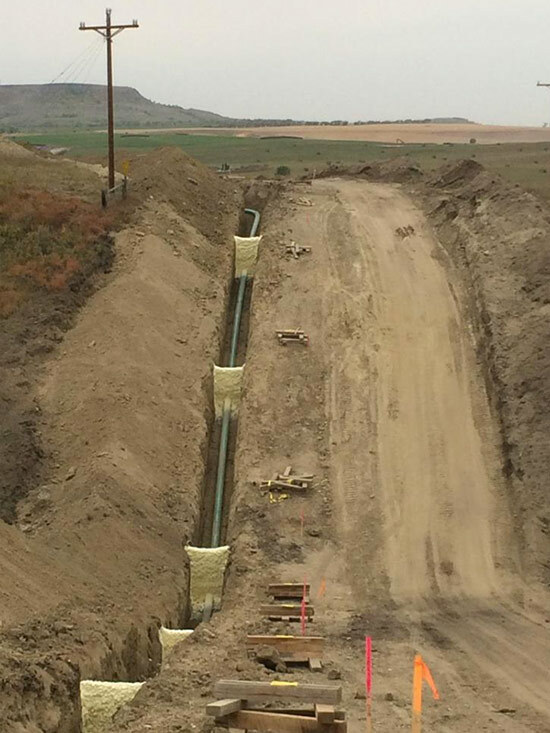 When constructing a pipeline, construction companies need to install trench breakers, or water stops, to prevent erosion of native soils and to ensure the pipe remains covered. Traditional methods involve building these dikes out of sandbags. Contractors have known for many years that this approach is dangerous, time-consuming, costly, and ultimately ineffective. Sandbagging crews need to get down into the trench while assembling the breakers, which exposes the crews to a multitude of risks. Such crews often report construction 8-10 breakers in a day. SPF breakers can be sprayed in roughly 7 minutes each, allowing for as many as 60-70 to be completed per day. Workers do not have to get down into the trench during the construction process, minimizing risk. The foam is also inert and will not degrade over time. This will ensure that they stay where they are designed to stay, and function as they are designed to function, for decades after installation. The same cannot be said about sandbags. Due to the efficiency of the spray foam process, foam breakers also offer tremendous cost savings as well as labor hour savings to contractors. Innovative Foundation Supportworks is your experienced structural repair contractor, specializing in a wide range of geotechnical solutions to solve your needs. We install trench breakers in ND, MN, SD, IA, WI, MI, OH, IN, IL, MO, AR, OK, TX, NM, AZ, KS, CO, ND, WY, UT, CA, NV, OR, WA, ID, MT.